Interview with Duotrope (October 2011). Interview with Chicago Publishes (July 2011). Interview with Literary Chicago (March 2011). Biography with JVLendnote (February 2012). Interview with Six Questions For… (April 2012). Mention in the Chicago Tribune (June 2012). Interview with Chicago Literati (June 2013). Interview with Gapers Block (June 2013). NewPages.com review of Anobium: Volume 1. 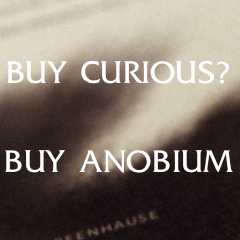 Conium Review review of Anobium: Volume 1. Curbside Splendor review of Noospheria.